The annual MTZ-BioQuant Award for Systems Biology aims to reward outstanding young scientists working in the interdisciplinary research field of Systems biology. It is designed to foster talented Post docs in the Heidelberg area up to five years after Graduation who have made significant contributions to the research field of Systems biology. The Award is made available by the MTZ foundation and is endowed with up to 5.000 Euros. Potential candidates for the MTZ-BioQuant Award need to be nominated either by a Member of the Faculty of Biosciences, the Faculty of Medicine or the Interdisciplinary Center for Scientific Computing (IWR). Nomination requires an outline of the nominee’s scientific record (Nomination form), and the nominee’s CV including a complete list of publications. 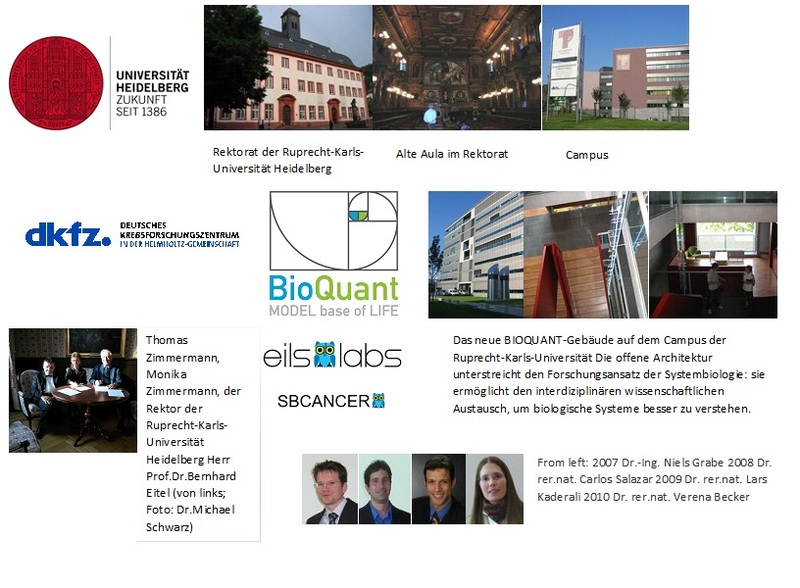 The new interdisciplinary BIOQUANT centre was officially opened in Heidelberg on 19th April 2007. The centre combines two internationally renowned priorities of the University of Heidelberg: molecular biological and biomedical research and its expert knowledge in scientific computing. BIOQUANT aims to use systems biological approaches in order to quantitatively understand complex functions. BIOQUANT (Quantitative analysis of molecular and cellular biosystems) strengthens interdisciplinary research, both within the University as well as in conjunction with extramural research institutions (EMBL, DKFZ, Max Planck Institute for Medical Research). “Mathematicians, computer scientists, chemists, biochemists, physicists and medical doctors will work together in order to find a common ‘language’ that will enable them to adequately describe complex life processes and the enormous variety of living systems,” said Professor Jürgen Wolfrum, who is one of the founding directors of BIOQUANT along with Professor Roland Eils (Head of the Department of Theoretical Bioinformatics at the German Cancer Research Centre) and Prof. Hans-Georg Kräusslich (Director of the Department of Virology at the Institute of Hygiene at the University). The connection with SBcancer of the German Cancer Research Center dkfz. as extramural research institution is very important for the MTZfoundation. This defines the uniqueness of Heidelberg as site scientific research. Systems biology deals with understanding and depicting the complex and dynamic processes inside cells or organs, e.g. during acclimatization, ageing or immunodefence. The wealth of data on different cell elements or functions which were gathered at different levels of the life processes (genome, proteome, metabolome) must be put in a meaningful overall context and modelled on the computer, so that simulations and forecasts become possible without laboratory experiments. A mainly qualitative and descriptive approach oriented to molecular details is still characteristic of research in the life sciences today. The wealth of data on different cell elements or functions which were gathered at different levels of the life processes (genome, proteome, metabolome) must be put in a meaningful overall context. This is the only way to describe and understand complex system characteristics such as the regulation and control of biological systems, their manageability and system behaviour. Modelling life processes has great and promising application potential. Major progress is expected in particular in the development of new medical drugs. An interdisciplinary research approach which combines biology with computer sciences, mathematics and the systems and engineering sciences into one "systems biology" can make a major contribution. Systems biology pursues a holistic approach and aims at developing close-to-reality models of physiological processes in cells, cell aggregations and entire organisms in order to obtain a holistic understanding of the life processes. With the publication of the guidelines for the funding priority "Systems of Life - Systems Biology", Germany has given the go-ahead for a new interdisciplinary research programme. In the centre is the model system "liver", which is focused on hepatocyte cells. The liver is a highly complex biochemical factory which synthesizes, modifies or catabolizes over 10,000 substances daily and provides the body with vital substances such as proteins, carbohydrates and fats. The liver is a highly suitable model system for systems biology research because this cell type fulfils a large number of different tasks and thereby provides numerous possibilities for application in medicine, pharmaceuticals research and the area of nutrition. The ultimate objective is a virtual cell which can simulate physiological processes in silico, in short the "glass liver cell".